With the coming of Internet, e-commerce has become the highway to success for every type of business. You can find success stories of several small business like furniture and books which has gone global and have made sales of millions of dollars annually, thanks to e-commerce. E-commerce is undoubtedly the next big thing. The next big market. Earlier for building an e-commerce website, people should have all the technical knowledge and an excellent catalog of products to start their business online. But that was the past. Here’s the present. You can set up e-commerce websites within a matter of seconds and ease with the help of electronic commerce website builders. You can control almost every bit of your e-commerce site without even prior knowledge to any coding. Isn’t that great? 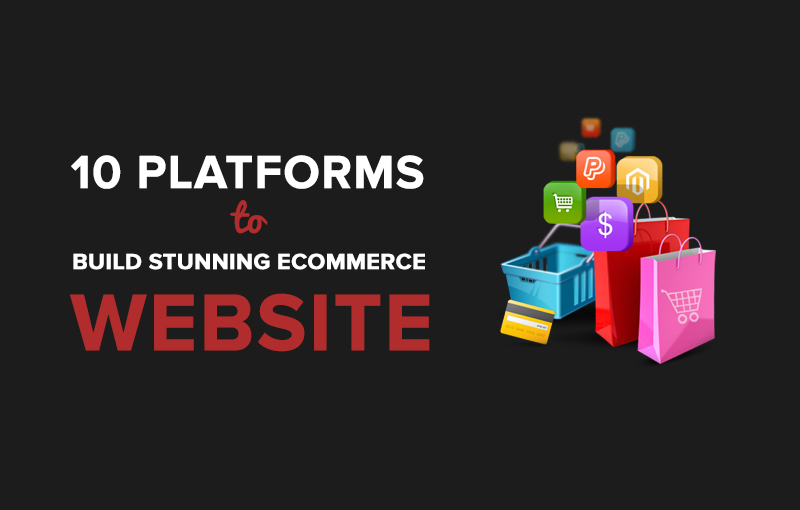 So today we are here with a list of 10 best e-commerce building platforms you should not try to miss. Shoplift is one of the great e-commerce website builders who will help you build impressive looking e-commerce website within minutes. It hosts a vast number of websites which includes some favorite websites too. You have got a wide range of beautiful-looking templates to choose from, and if you don’t like any one of them, you can go for custom-made them too which you can built from scratch according to your needs. Shoplift has got fully CMS-integration. To increase the functionality of the websites, you can even add add-ons that will help you at SEO and so on. The basic package starts from $29 per month and provides a lot of features. With the help of AmeriCommerce, you can easily build e-commerce website without any prior knowledge of coding. You can instantly create web sites with large sub-units and interactive websites. With the help of web builder, you can quickly add content, complete product catalogs, customize the background image of each page easily. It comes packed with several innovative features which helps you to increase your sales such as promo codes, conducting contests and integrating social media networks directly. The theme is very responsive and works with almost every type of screen. Be it a tablet, laptop or phone. Plans start from $24.95 per month which offers you about 250 MB of storage and 2 GB traffic. It is one of the popular services available on the web you can easily navigate around the website and use it, thanks to its drag-and-drop functionality with which you can easily customize almost every bit of your website. Along with that, it comes with a wide range of themes designed by professional designers with which you will instantly fall in love with. It comes packed with several important features such as taxation, product inventory, shipping costs calculator to run the website on auto-pilot mode. It is SEO optimized, and it also comes with a set of SEO tools that will help you perform better by tweaking ins and outs of the website. The website is responsive and can be readily available from several types of display sizes. Plans start from $16.67 per month which offers amazing features like 20GB storage, your domain, 10 GB bandwidth. BigCommerce is an easy to use website builder, which will guide you through each and every important process to build the perfect eCommerce website from choosing the domain name to setting up email accounts, it has got everything in it. It has got a set of powerful SEO tools that will help you rank your products higher in search engine rankings. It also provides you with amazing marketing opportunities like coupon codes, social media integration and so on. It has got Google Analytics integrated in it, so that you can track all of your consumers and gives you more than 60 types of payment gateways so that a wide range of people can pay out through the way they want. Plans start from $29.95 per month which offers amazing SEO optimization, discounts and gifts management and much more. The web is one of the complete e-commerce builder websites. It has got some really amazing and innovative features like helping you rank higher in local search rankings, frequent submissions to all the popular online directories to enhance the reach of your website. It’s quite easy to use and in case you run into some sort of problem you can check out the videos from their library of videos that will help you out. In case, it doesn’t tour can still have a conversation with them via email or can call them. You can set-up your payment processing service that accepts all the major credit cards and debit cards all around the world. Plans start from $29.95 per month which offers 5 GB disk space along with a variety of good-looking templates to choose from. Volusion has got set of all the tools required to create an e-commerce website and sell anything online. It has got a wide-range of free and premium themes along with several add-ones both free and premium to add more functionality to the website. It also offers you SSL certifications to make tour site secure, payment processing features, integrated live chat to communicate with your users. To help you out, they have got a full range of tutorials and FAQs to clear your queries and questions. Usually, most of the questions gets answered by that only. Other than that, you can contact that 24 x 7 hours. Volusion’s minimum plans start from $15 per month which gives almost all the above features, tools for social media, taxation system. With the help of this, you can easily build e-commerce websites with good flexibility and responsive that will perform well on various types of screens. It’s highly customizable, and you can easily customize almost every bit of your website. It offers you a wide range of vivid themes with extra functionalities like integrating social media websites and also Facebook store. To use Pinnacle cart, you don’t even need to code a single line! The basic plan starts from $29.95 per month which offers you 2 GB of website traffic, unlimited number of free backups and free comprehensive support. You can build e-commerce website from scratch without even coding a single line. Isn’t that great? It just shows the powerful control panel which helps you to control almost every bit of the website easily. It is well-integrated with Google Analytics to offer stats about your consumers. It also automatically generates SEO options for your website which helps you to rank higher in search engines. It also offers excellent security which ensures that your user’s precious data doesn’t fall into the wrong bands. It has got one of the most amazing plans starting from $10 per month which offers about 500 agB bandwidth, 2 GB of storage space and complete support. Amazing! Highwire is great for both the programmers and non-programmers. Firstly, you get an array of themes to beautiful looking themes to choose from which you can customize from almost every angle. For the programmers, you can easily change almost every bit of the theme according to the way you want. It helps you build responsive e-commerce websites which comes with several advanced features such as discount and coupon codes, social media integration to start off with. It also takes care of your SEO and your search engine rankings. With the help of the admin, you can control almost everything about your website. Moreover, it regularly and frequently take backups of your website to keep you on the safe side from the hackers. Plans start from $14.95 per month which gets you all the basic features along with few new features like eBay integration and regular backups. It is one of the easiest to use and build e-commerce website builder which will help you build e-commerce website like a boss. It has also got a powerful admin panel from where you can customize and tweak every part of your website. You can create complex and premium-looking e-commerce websites even without writing a single line of code. You can add various functionalities to it like payment gateways, shopping carts, shop navigation to name a few. Also you are blessed with several dashing looking templates which you can use for your website. Basic plans start from $16 per month and the pack includes 1 GB of digital downloads, frequent data backup and free support.